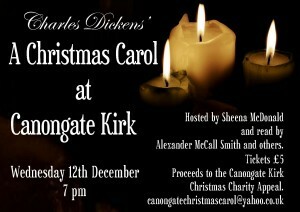 Canongate Kirk will be hosting a dramatic reading of Charles Dickens' A Christmas Carol. This memorable evening in Edinburgh’s Old Town will be full of festive music, familiar ghosts, and the magic of a shared story as read by Alexander McCall Smith and others. Tickets on sale in November. Proceeds will go to the Canongate Kirk Christmas Charity Appeal.